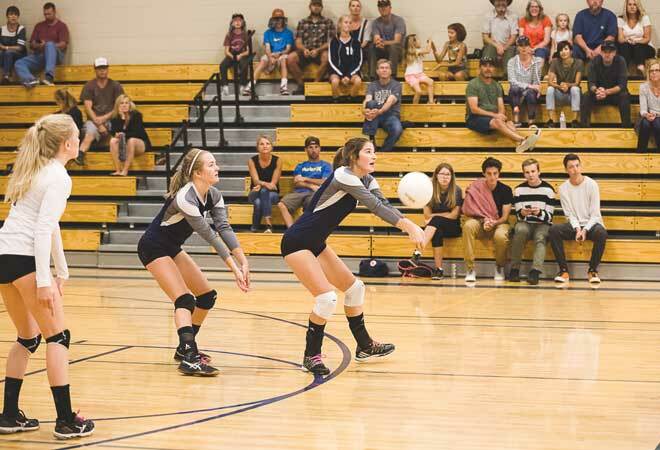 Composed is one way to describe the current Crested Butte Titans volleyball team, after watching them open the 2018 season with a win over the Caprock Academy Eagles on Saturday, August 18. They were tested at times and nudged into errors and team breakdowns here and there but in the end they remained calm, cool and collected as they won three of four sets to take the match win. Things were rolling for the Titans in the opening set. After trading off the first several points, the Titans built a 14-8 lead with a strong service run and a big hit from Audrey Griffin had the Titans up 18-11. But the wheels started falling off for the Titans and the Eagles were able to climb back into the game tying it up 22-22. The Titans regrouped and a service ace and an Eagle hitting error helped the Titans eke out the 25-23 first set win. Caprock Academy built off their surge in the first set to win the second set 25-22. While the Titans got big hits, the Eagles relied on their star middle hitter and she came through big to help lead them to the set win. With rallies changing matches one way or another, the Titans needed to clamp down quick before they dropped another set. McNallie took the opportunity prior to the third set to refocus her team and set their sights on finishing off the Eagles. The Titans took McNallie’s advice and came out in the third set the way they started the match. Better communication and better movement helped the Titans take a 9-4 lead. Ramsey and libero Niki Rehberg all fired off big hits and the Titans started pulling away, taking a 20-9 lead. They started to falter again but regrouped soon enough to win the third set 25-16. The Titans stumbled through the opening points of the fourth set but a service error by the Eagles opened the door for the Titans and they started charging, winning 13 of the next 17 points to go up 20-11. Caprock managed a couple more points but the Titans remained stout and focused to score five of the next seven points for the 25-14 set win to take the match. The Titans will hit the road this weekend to face perennial league powerhouse Sanford. While first-year coach McNallie has yet to see Sanford play, she believes they should put up a fight. 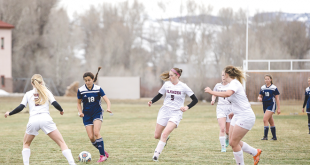 “The girls are expecting to lose to Sanford but with that first win and the way we’ve been practicing, I’m hoping we can pull out a win,” says McNallie.